Can I be electric too? Moving right along. 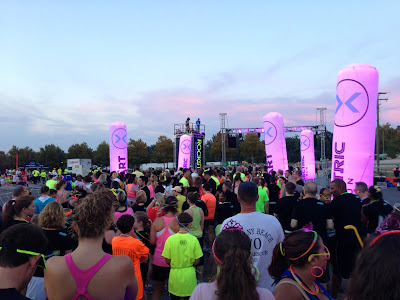 As I detailed in my post about upcoming races, I signed up for the Electric Run 5K a few months ago, and when the day finally dawned (or should I say dusked?) it was a good one: not too terribly hot and not at all rainy. The race instruction email promised traffic congestion due to the many race attendants and also because, duh, DC, so Scott and I arrived at the National Harbor about an hour before pre-race festivities were scheduled to start. We wandered along the harbor a bit, walked out on the pier, investigated some bizarre statuary, ducked into some shops, and then headed to the provided address for race pickup, where we frowned at a locked building for a couple minutes until a nice policewoman directed us toward the ACTUAL location. Emails are such liars sometimes. Race pickup was provided same-day for a $5 fee. 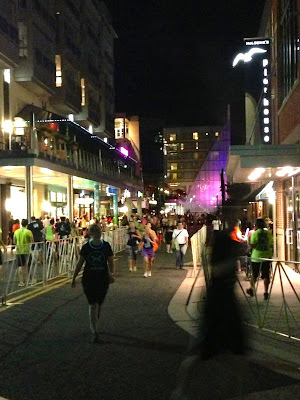 I thought this was somewhat poor form, given that pre-race packet pickup was available only on the preceding Wednesday and Thursday in Virginia, half an hour or more around the dreaded beltway for us poor Maryland participants, but what're ya gonna do. Scott and I grabbed our packets, accepted a free can of Rockstar energy drink (verdict: fizzy but too fake-sugar-tasting), then went back to the car for a bit to eat some snacks and dig through our goodies. 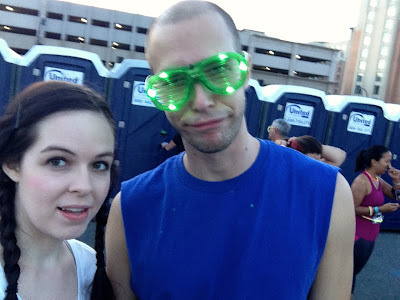 Our packets contained an Electric Run shirt, a motion-activated light-up bracelet, some bizarre glowstick glasses that I didn't bother opening, our bibs, and safety pins. The guy sizes were tech shirts, but the girl sizes were sadly plain ol' cotton. Less sad: when I tried mine on I found it fit perfectly and was super cute, so score! After a quick bathroom pit stop, we returned to the pre-race area around 7:15PM to investigate a mystery. 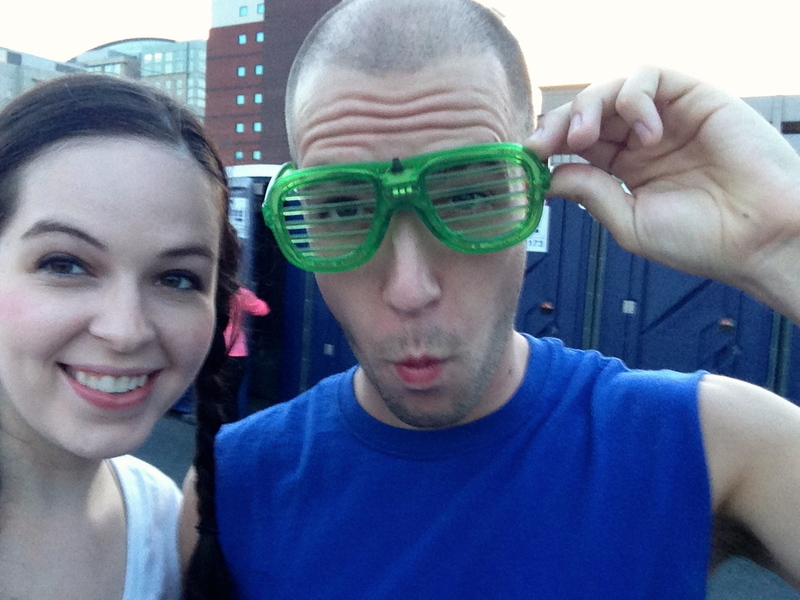 A week or so earlier, I had received a strange email - a "receipt" for LED shutter shades, grand total $0.00. 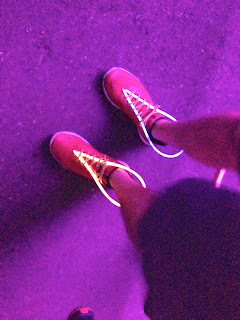 I asked around and was eventually directed to the store tent, where I was informed that as I was one of the first fifty people to sign up for the race, I was entitled to a free pair of light-up glasses. Scott was way more excited than I was, so I let him pick out a pair in his favorite color. Then we of course had to take multiple photographs to get the proper shot with all the lights on. 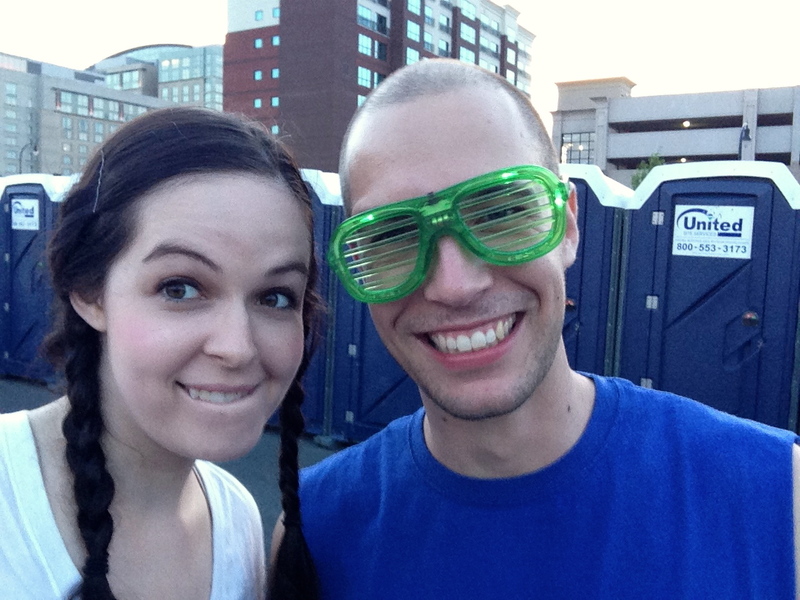 Complete with classy port-o-potty backdrop! There wasn't much else to do in the pre-race area, so we went ahead and lined up for the race. There was an emcee and some assistants warming up the crowd with music and various freebies like glowsticks, hats, and light-up foam baton-type things. There was no shortage of glowsticks handed out, believe me. One of them smacked me right in the nose, so I wound up a bit gun-shy; with every subsequent handful thrown, I ducked! People got quite creative with their use, Scott included. assures me is more than sufficient. The crowd was partitioned by rope, and in that way we started in waves. Scott and I were far enough forward that we were able to start in the second wave. I fired up the MapMyRun app and we were off! The race began with a slight uphill followed by a delightful downhill lined with those glowing blow-up pillars as seen above. I think I may have turned on a little TOO much speed in my delight over the downhill segment, as we finished the first mile in 9:02 - not fast for a lot of you, but I'm usually more of a 10:00 girl! I blame this on Scott. You see, he is one of those obnoxious natural athlete types who just does this stuff naturally. He swims and does yoga and plays soccer, but he doesn't run much at all; yet he pretty much danced his way down the course and was barely winded. Stupid tall people with their long strides. Jerk! ;) I held my own, and we did slow down and stop to take some photos later, but I'm sure he could've left me in the dust if he wanted to. The course was punctuated, as promised, by music and light-up surprises. There was a hydration station at the halfway point, where we were handed some sort of Rockstar vitamin water-type product. We didn't much care for the taste so we tossed them in the trash in favor of good old-fashioned water, attractively presented! Annnnnd we took off again. There were lots of spectators clustered around the water area, and Scott and I wantonly distributed high-fives to long rows of hands! 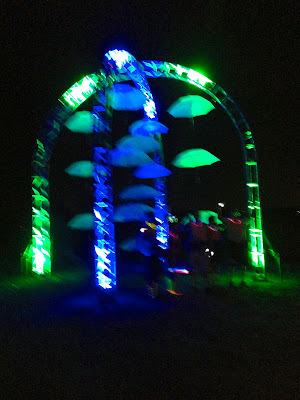 The second half of the course was similar to the first, with portions of light and music - and even an umbrella photo op. Perhaps you are wondering about our ultimate finish time. Well, so am I. For some reason MapMyRun decided to pause itself at 2.58 miles with 26:48 minutes on the clock. :( We kept a pretty good clip the rest of the way but we also stopped for photos a couple times, so I'm just calling it 33 minutes. That's gotta be close. At the finish, we were plied with more water and granola bars. We also received another free can of Rockstar, this an uncarbonated version which I didn't particularly enjoy; I gave most of mine to Scott. There was the option to buy drink tickets for beer, but all they had was Miller Lite and we weren't really feeling that. There was also another merchandise tent if the need for an Electric Run t-shirt or glowing hoodie struck you belatedly. In addition to playing pop, hip hop, and techno music mashups, the deejay and his assistants distributed a ton more of those freebies - the same glowsticks, light-up batons, and hats from the beginning, plus a sweat band. Scott snagged a headband and I nabbed a hat, both of which were uncommon but not overly difficult to obtain; but seriously, if you didn't get a glowstick, it could only be because you were willfully refusing to see them. The batons were easy to come by too; I think Scott obtained and subsequently gave away two or three of them. 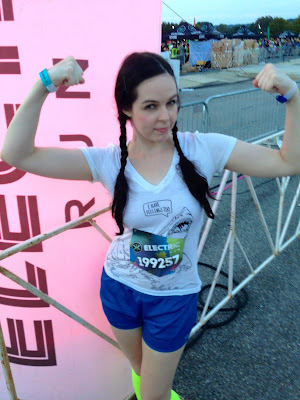 So yeah, that was really fun, and after all my long distance training, 3.1 miles felt so short! My only complaint was in the amount of scenery. The race description made it seem like there would be something new to see and hear every couple minutes, so I didn't bring my iPod, but in reality I'd say there were only seven or eight short areas set up along the course and not enough music. In the future I hope they add a lot more ambiance to the race. I don't know how long they gave you to finish or how many waves took off, but when we left over an hour later there were still plenty of people heading toward the finish line (although we could also see the halfway point and it was empty). Things seemed pretty low key, so this might be a good first 5K for beginners. 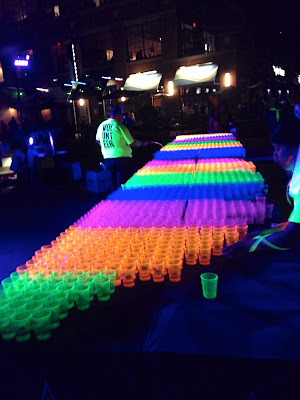 This coming Saturday Scott and I take on the Color in Motion 5K - how will it compare? Will we make it out alive?! Tune in next week to find out! that looks like a lot of fun--If you have any residual glow sticks send them along, I'll use them for tower of terror. Those pictures just gave me so many ideas for crafts and stuff! Um, "She's Electric" is TOTALLY my favorite Oasis song. And I LOVE Oasis. So. Yay 90s British alt rock!!! The Electric Run provided no clocking of any time; we'll see what happens at Color in Motion. I'm seriously considering investing in a Garmin. The prices make me a little sad, but I'm not sure how much I can trust Map My Run. When it WAS working, it seemed to be .1-.2 miles different from the course mile markers. SOMEBODY was off... I'd really rather be sure, you know? Which model do you use? Do you like it? Yeah, that's how much my Map My Run was off by, too. And it was NOT in my favor, sadly. So I saw my times take a hit when I bought the Garmin, but it has proved to be insanely accurate when I run with it during races, so I really trust it. I got the Forerunner 10 around this time last year, because I didn't want one that's overly complicated and also because it comes in pretty colors. It has all the basic components I wanted: it tracks distance, calories and speed/pace. You can set it to auto pause, alert you at every mile, and even set a goal pace so it will beep at you if you're ahead or behind it (I don't use that last function; too stressful). I love it! Ooh, I'm hearing good things about the Forerunner. Mostly what I need to decide now is whether I'm feeling patient enough to make it a Christmas present! Squirtgun To Your Head: Favorite WDW Store?